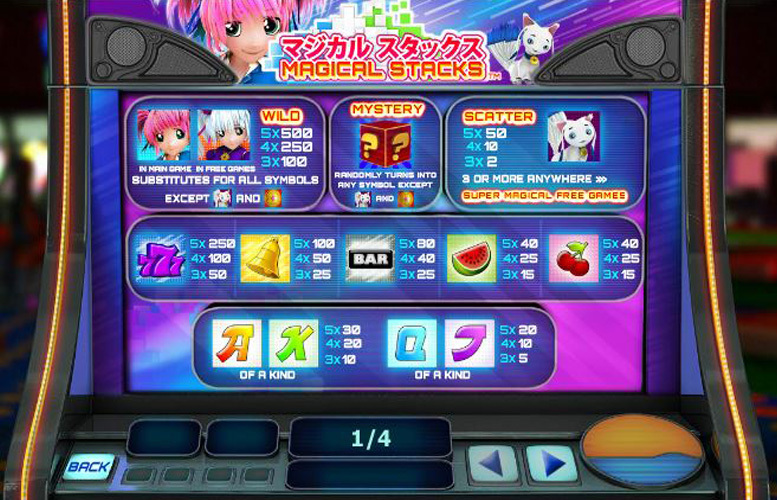 Playtech’s hyper-Japanese title Magical Stacks is ideal for those who don’t like to mess around on their slots. The action is rapid, and can be even kicked into high gear with the turbo mode. It’s easy to imagine someone getting a little too carried away under the influence of Eastern techno, and endless flashing lights. If you can handle the pace, however, this machine is great. It’s heavy on the anime stylings, and this compliments the up tempo feel of the game well. Fast paced from the get go, and with great music. You can even use a turbo mode for an even greater rate spins-per-hour. Visually appealing. 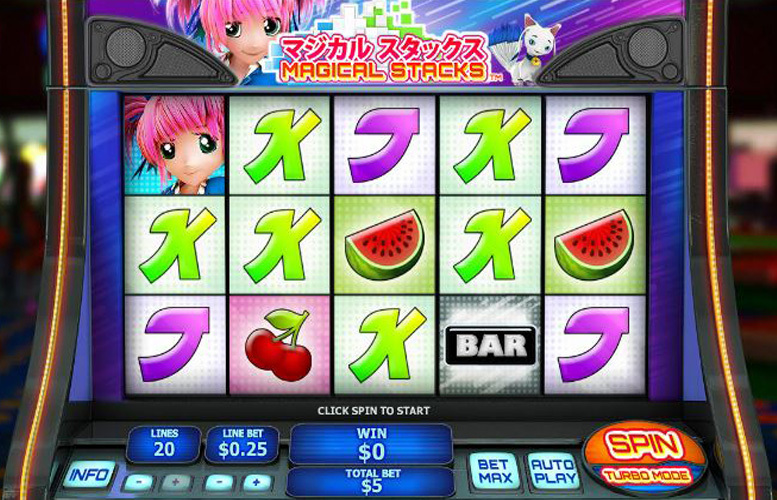 Bright lights, and anime inspired art work usually works well, and this slot has an unmistakably “dance-mat” charm about it. The speed is an issue. If you’re going to use the turbo mode particularly with auto-spins enabled, make sure you double check your stake size before you activate it. Mistakes of this nature could be costly on such a fast machine. Low base game prizes. There is no four-figure pay out during the main game, and this is certainly an issue. Wild = 500x the line bet. 777 = 250x the line bet. Liberty bell = 100x the line bet. Bar = 80x the line bet. Watermelon, or Cherries = 40x the line bet. The Magical Stacks slot does make up for some of its shortcomings in the prize department with its features. There’s a few interesting ones available, and be much more lucrative than hitting big combinations of symbols in the base game. Mystery symbols are represented by a box covered in question marks. They can randomly transform into any other symbol except the scatter cat, and the shield emblem. 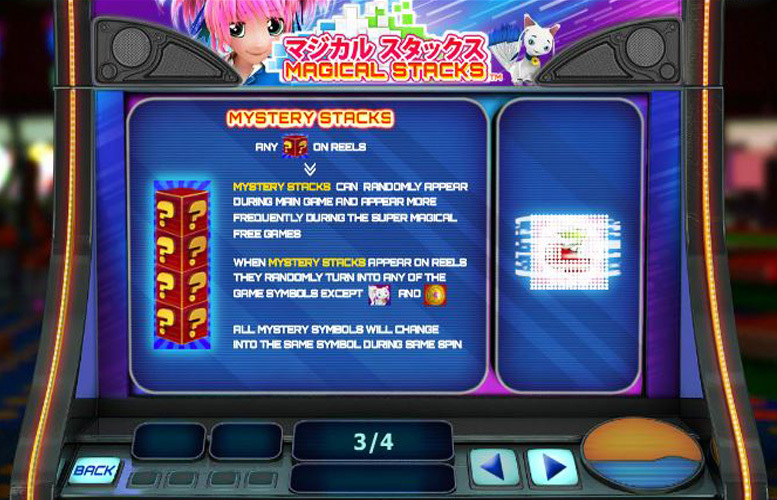 In addition to these random symbols, mystery stacks can also appear. Mystery stacks are just like their single box counterparts except there are more of them. They’ll all transform into the same symbol and this can result in some massive wins. Players who hit three or more of the adorable anime styled cat symbol will win ten games with a dynamic multiplier. Initially they receive a random multiplier between 2x, and 5x. Landing the shield on reel five during the free spins will increase the multiplier. However, if they hit the shield symbol anywhere else, the multiplier decreases. The maximum possible multiplier is 5x, and the minimum is 2x. As well as this, there are additional mystery box symbols scattered amongst the reels during the free spin round. 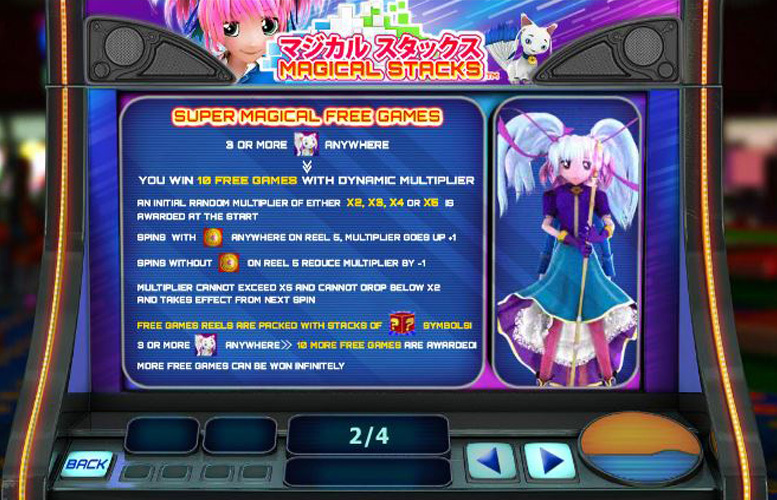 Free games can also be retriggered with the scatter cat symbol by landing three more across any reels. This can repeat indefinitely. Ace, or King = 30x the line bet. Queen, or Jack = 20x the line bet. Both the number of lines and the amount bet per line can be adjusted during play in Magical Stacks. This gives the player considerable scope to switch up their bet sizes, and allows the machine to cater for all wallets. With a maximum of 20 lines, and the highest line bet of £100 set, the largest cost per spin on the game is a whopping £2,000. Meanwhile, setting all the variables to the minimum (one line, 1p per spin) will result in a much lower gaming experience – just 1p per spin. The Magical Stacks slot is a high-paced, action packed game which is sure to delight players both on the feature front, as well as stylistically. Its nods to the world of anime, and racing Japanese techno soundtrack compliment the overall feel of the machine well, and despite its somewhat low base game prizes, the game is most enjoyable. Just beware about getting too carried away with all the bright lights and pounding rhythms – those turbo spins can soon add up. This game has a rating of 4 / 5 with 298 total reviews by the users.